This middle grade novel set during the Great Depression is an interesting character study about a young girl who gets angry when other kids comment on the fact that her father is in jail and acts out as a result. The story has a moral, but not a preachy one, and I enjoyed Queenie's journey as she started to gain control over her emotions. I own books one and three of this trilogy about two sisters living in Kansas at the turn of the 20th century, and because this second book is so rare, I thought I'd never see it. I was so surprised when my husband brought it home the other night! It's a library copy borrowed through inter-library loan, but I got to read it, and I loved seeing how this story bridges the gap between the other two books. Because the story involves a road trip, there are also lots of fun details about the way early cars worked. I'll have a review next month sometime. This book was pretty terrible. It talks quite a bit about hoarding, and much of the advice seems to be a paranoid response to a fear of becoming a hoarder. As the child of a hoarder, I was surprised that the author, who has relatives who had this problem, seemed to think that all you do is call in some professional help and the problem goes away. Hoarders have to want help; otherwise, legally, they are permitted to live however they wish. Also, people who simply have a hard time getting organized or knowing how to start de-cluttering are not hoarders. The author says this, but then seems to go on as though we are all one box of mementos away from a serious mental problem. Personally, I think all the hoarding stuff should have been cut. Aside from that, the suggestions for living a more minimalist lifestyle are pretty generic, and other than vague references to being "not of this world," there is nothing particularly Catholic about much of the advice. The author also suggests getting rid of stand mixers, woks, and even microwaves, which would be completely ridiculous in my household, as those are our top three kitchen tools! I would not recommend this book. I started this as an audiobook, then found a copy on OpenLibrary and finished it there. I love the way Krista Davis writes, and I really enjoyed all the personalities she introduced in this first book of the Domestic Diva mystery series. I also thought the mystery was really well thought out and surprising. 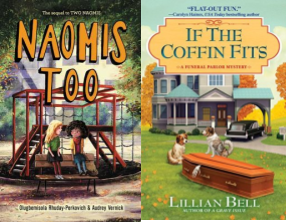 I'm planning to skip ahead a few books and read a Halloween-themed mystery from this series during October. I got 50% of the way through this book before my loan from Open Library ended. When my turn came up again, I was determined to finish it, but I was reading too many books and really not enjoying this one. I finally decided that, even though it was for a challenge, I couldn't justify reading another 200 pages of a book I didn't like when so many other books are waiting for me. 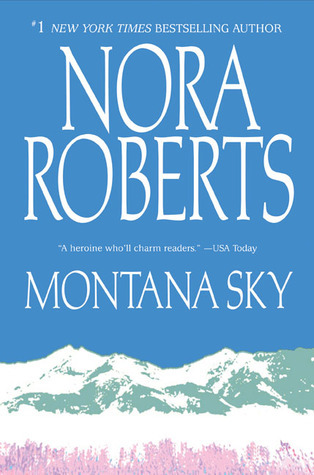 I'd still like to read a Nora Roberts book, but the only ones I've ever really enjoyed were the Bride Quartet books, and I've read all of them. I'm really enjoying this now that I'm halfway through my second time borrowing the ebook from the library. I like that the book is teaching me more about Baltimore and the state of Maryland in general. I also really enjoy Tess and her many friendships with a host of diverse people. I didn't spend as much time with this book this week as I wanted, but I am excited to get back into it. I really like the writing. I love this series. Mulhern can even get away with ridiculous character names like Anarchy and Khaki. This is my next audiobook. The main character is a library director and the story is set during leaf-peeping season in Virginia. I'm enjoying it so far. I'm reading this for a Well Read Mom book club that I'm doing with a couple of my friends. I have a few weeks before we meet, but I took a peek at the first chapter, and I love the writing style already. I may not get into it again until next week or so, but I have a feeling I'm going to enjoy it. I'm reading this for some homeschooling "professional development." I read a few pages a few weeks ago, but it's pretty slow-going and I'll probably need to start over and just power through it to get all the information. I have a digital ARC of this book and I need to get to it ASAP so I can post a review before too much time passes since it was published on 9/11. This is another ARC of a book published on 9/11 that I keep forgetting to start. Now that I have a Chromebook, I can't read ARCs on my computer anymore, and I'm having a hard time getting into the habit of reading these exclusively on my phone. Hopefully adding them here will help me remember! I love the titles that cozy mysteries get. It makes me want to read them all. I hear you on the Nora Roberts book - sometimes you have to make the tough decision to toss it and move on to something new. I'm intrigued by The Diva Runs Out of Thyme -- going to have to go see if we have a local copy of this one. Thanks for all the shares, Katie, and have a wonderful reading week! 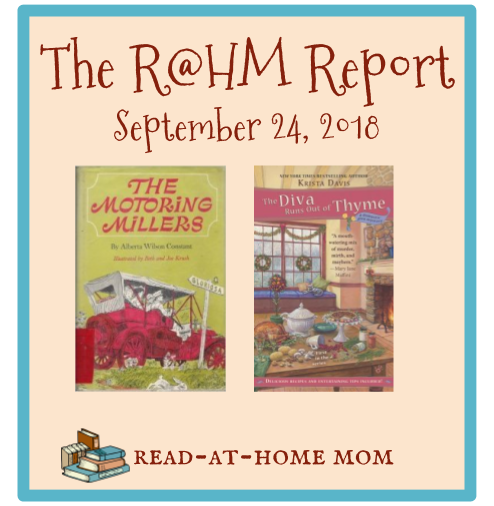 I must have read Queenie Peevy and The Motoring Millers in middle school. They sound super familiar! It's been twenty years now since I've read a Nora Roberts novel. It takes me back in time.